Suilven is one of the most characteristic mountains in Assynt and in Scotland. Lying in a remote area of the the North West Highlands, it rises almost vertically from a wilderness landscape of moorland and lochs. Suilven forms a steep-sided ridge about 2 km in length. The highest point, known as The Grey Castle, lies at the northwest end of this ridge. 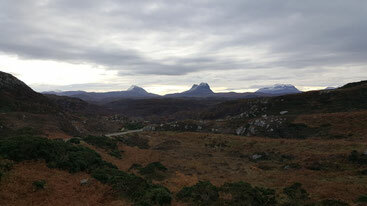 Download the walk to Suilven.